Here they are! 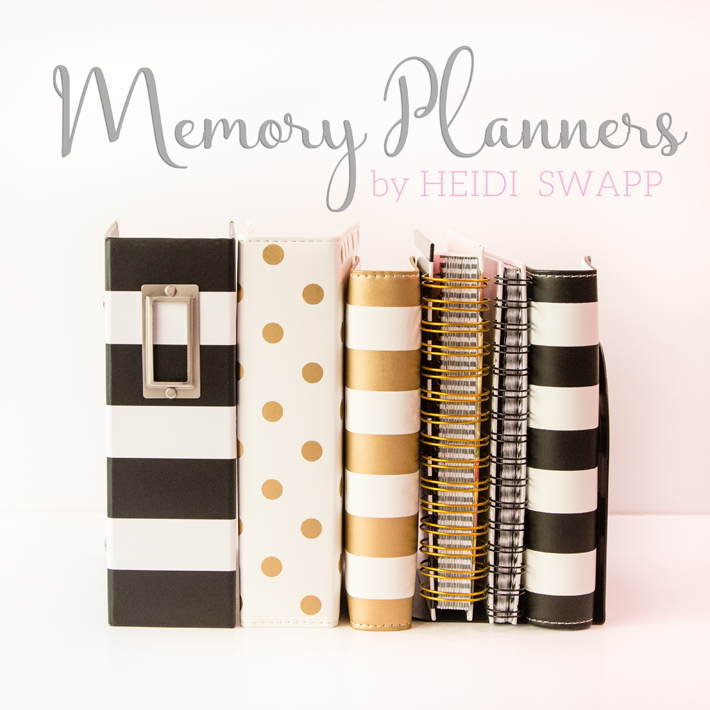 5 out of 6 Heidi Swapp 2016 Memory Planners and the 4" Storage Binder! Let me introduce you to them left to right! You can find an updated post about these planners right here. 1. 4" Storage Binder to keep pages that you are either done with or not using. Last year we noticed our planners were too full or that we had months in our planner that we didn't need to lug around with us everywhere! This is where I am going to be storing those during the year and in one place! Shipping to independent and online stores. 2. Gold Polka Dot Binder Memory Planner has bigger rings than last year. The layout has improved and there is an acrylic gold foiled dashboard page. The inside is beautiful that I just might have shed a tear at it's design. No joke! Shipping to independent and online stores soon. *Now arriving in Michaels Stores. 3. The personal sized Gold Stripe Planner is perfect to keep with you in your purse. It has smaller rings even though the spacing is the same so all the accessories will fit it. It is perfect for all those appointments, meal planning, fitness planning, etc... It has beautiful gold foiled cardstock dividers. Shipping to independent and online stores soon. *Now arriving in Michaels Stores. 4. The Gold Spiral Planner is a Boxed Kit for Michael's Stores. You can scroll down my Instagram feed and see more photos of this planner. It comes with a big spiral and has lots of room for junking it up! The layout is the same as the Gold Polka Dot planner. There are lots of embellishments that come with this kit. This is shipping to stores now and should be setting soon, stay tuned in! *Discontinued at Michael's Stores and shipping soon to independent and online stores. 5. The Instax Planner Kit says "Make It Happen" on the front and you can see more photos of it in my Instagram feed. It has a smaller black spiral and you can add photos but it isn't made for excessive scrapbooking inside. The layout is different than any of the planners. I love the accessories that come with the planner including gold foiled stickers for the months in Heidi's handwriting. This is in Michael's Stores NOW with the new Instax products. 6. Well hello there Black and White Personal Planner Boxed Kit. This personal planner has the same layout as the Gold Striped personal planner. The difference is that it has acrylic dividers that are completely different than the other personal planner. This planner does not have gold foil inside but equally as beautiful. The embellishments in this planner are so beautiful it will be hard to use them. This boxed kit also ships to Michael's the same time as the Gold Spiral Planner and will be there soon! *Discontinued at Michael's Stores and shipping soon to independent and online stores. *** 7. Not shown is the Gold and Stripe (no foil) Large Binder Memory Planner. This planner is in Hobby Lobby stores and has the same layout as the Gold Polka Dot, just -- well, without gold foil. It will also be shipping to independent and online stores soon! Create Well: Which one will you choose? Omg, how could anyone pick just one!! When and where can i get these? The gold stripe says independent and online stores. How do I know what online stores? Thanks! New fan here! I am from Austria and I have a lot of planners from Heidi Swapp. I like all of them.